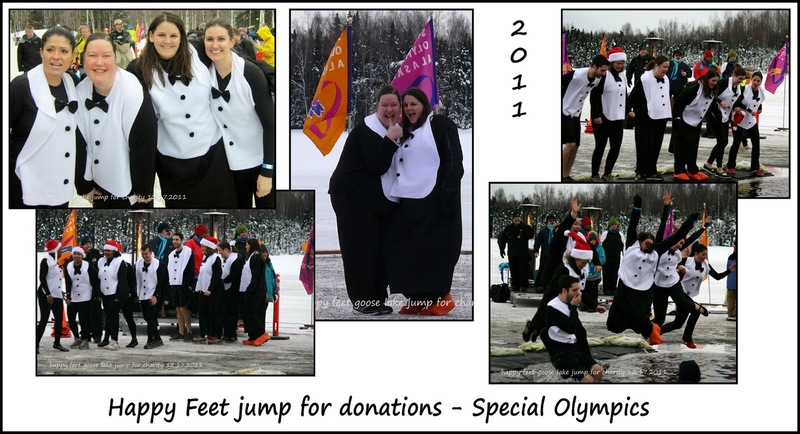 A few composite photos of the Special Olympics Polar Plunge that my daughter Alicia participated in with co-workers, the "Happy Feet." Met CJ and Alicia in the UAA parking lot for the bus ride a short distance to Goose Lake for all the festivities and jump at 1pm Saturday. We left Soldotna at 830am; Patti drove (with her Ford Escape 4x4 - I'm suitably impressed because of poor driving conditions on the return trip) and we had a great time, staying overnight with Jason and Lynette for a holiday visit. Missed grandson, Devin, for a hug because he was working. 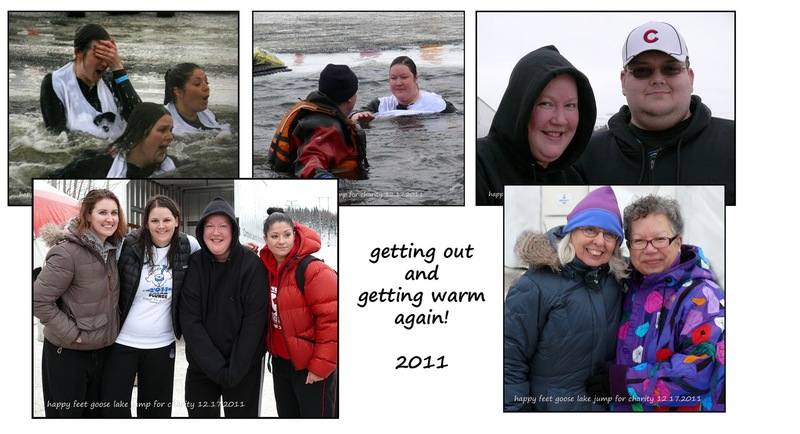 Back to the EVENT - Alicia was surprised a little by the cold - said freezing is an "understatement." So shocked her system that for a few seconds almost couldn't move her legs or breath! I can't imagine! Turned out great!!! Wish we could have been there!! They ALL need a Bravery Award I think! I've got goose bumps just looking at the pics. That took lots more courage than I have! Great pictures and so happy it all turned out well. I was a little worried, to tell you the truth, because I have been in icy water once and know what a shock to your system it is. Good job, Alicia! Glad you and Patti made it safely back to Soldotna too. Much love to you, Karen! At least this year the weather was warmer...last year a friend did this and it was 4 below. I made Krumkrake's this week they turned out pretty good! I actually saw this on the online news! Well, I'm relieved she survived and I will admit that I thought of you all this weekend with WARM thoughts! Looks like a fun event and certainly a worthy cause! brrrrr...that's all I can say. Such a wonderful act of kindness for such a great cause!!! I'm sure they were all chilled to the bone!!! Congrats to all of them!!! !